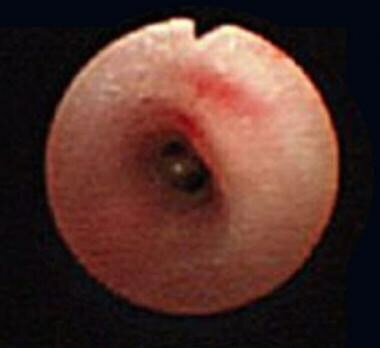 Normal airway color and architecture (in a child with mild tracheomalacia). Airway of a child with chronic bronchitis shows erythema, loss of normal architecture, and swelling. Chronic bronchitis is recurring inflammation and degeneration of the bronchial tubes that may be associated with active infection. Patients with chronic bronchitis have more mucus than normal because of either increased production or decreased clearance. Coughing is the mechanism by which excess secretion is cleared. Defining chronic bronchitis and its prevalence in childhood has been complicated by the significant clinical overlap with asthma and reactive airway disease states. In adults, chronic bronchitis is defined as daily production of sputum for at least 3 months in 2 consecutive years. Some have applied this definition to childhood chronic bronchitis. Others limit the definition to a productive cough that lasts more than 2 weeks despite medical therapy. In children, chronic bronchitis follows either an endogenous response (eg, excessive viral-induced inflammation) to acute airway injury or continuous exposure to certain noxious environmental agents (eg, allergens or irritants). An airway that undergoes such an insult responds quickly with bronchospasm and cough, followed by inflammation, edema, and mucus production. This helps explain the fact that apparent chronic bronchitis in children is often actually asthma. Mucociliary clearance is an important primary innate defense mechanism that protects the lungs from the harmful effects of inhaled pollutants, allergens, and pathogens. 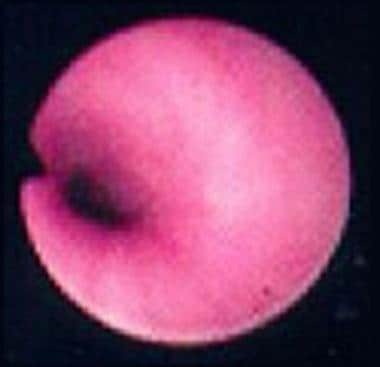 Mucociliary dysfunction is a common feature of chronic airway diseases. The mucociliary apparatus consists of 3 functional compartments: the cilia, a protective mucus layer, and an airway surface liquid (ASL) layer, which work together to remove inhaled particles from the lung. Animal study data have identified a critical role for ASL dehydration in the pathogenesis of mucociliary dysfunction and chronic airway disease. ASL depletion resulted in reduced mucus clearance and histologic signs of chronic airway disease, including mucous obstruction, goblet cell hyperplasia, and chronic inflammatory cell infiltration. Study animals experienced reduced bacterial clearance and high pulmonary mortality as a result. The role of irritant exposure, particularly cigarette smoke and airborne particulates, in recurrent (wheezy) bronchitis and asthma is becoming clearer. Kreindler et al demonstrated that the ion transport phenotype of normal human bronchial epithelial cells exposed to cigarette smoke extract is similar to that of cystic fibrosis epithelia, in which sodium is absorbed out of proportion to chloride secretion in the setting of increased mucus production. These findings suggest that the negative effects of cigarette smoke on mucociliary clearance may be mediated through alterations in ion transport. A chronic or recurrent insult to the airway epithelium, such as recurrent aspiration or repeated viral infection, may contribute to chronic bronchitis in childhood. Following damage to the airway lining, chronic infection with commonly isolated airway organisms may occur. The most common bacterial pathogen that causes lower respiratory tract infections in children of all age groups is Streptococcus pneumoniae. Nontypeable Haemophilus influenzae and Moraxella catarrhalis may be significant pathogens in preschoolers (age < 5 y), whereas Mycoplasma pneumoniae may be significant in school-aged children (ages 6-18 y). Children with tracheostomies are often colonized with an array of flora, including alpha-hemolytic streptococci and gamma-hemolytic streptococci. With acute exacerbations of tracheobronchitis in these patients, pathogenic flora may include Pseudomonas aeruginosa and Staphylococcus aureus (including methicillin-resistant strains), among other pathogens. Children predisposed to oropharyngeal aspiration, particularly those with compromised protective airway mechanisms, may become infected with oral anaerobic strains of streptococci. Acute bronchitis is generally caused by respiratory infections; approximately 90% are viral in origin, and 10% are bacterial. Chronic bronchitis may be caused by repeated attacks of acute bronchitis, which can weaken and irritate bronchial airways over time, eventually resulting in chronic bronchitis. Industrial pollution is also a common cause; however, the chief culprit is heavy long-term cigarette smoke exposure. Therapies include endoscopic debridement of the airway, vigorous pulmonary toilet, and aerosolized tissue plasminogen activator. Shah et al performed thoracic duct ligation, resulting in complete resolution of the formation of casts in 2 patients with plastic bronchitis refractory to medical management. These results suggest that high intrathoracic lymphatic pressures are related to the development of the recurrent bronchial casts seen in this disorder. Data collected from the National Ambulatory Care Survey 1991 Summary showed that 2,774,000 office visits by children younger than 15 years resulted in a diagnosis of bronchitis. Although the report did not separate diagnoses into acute and chronic bronchitis, the frequency of visits made bronchitis just slightly less common than otitis media and slightly more common than asthma. However, in children, asthma is often underdiagnosed and is frequently misdiagnosed as chronic or recurrent bronchitis. Since 1996, 9-14 million Americans have been diagnosed with chronic bronchitis annually. Bronchitis, both acute and chronic, is prevalent throughout the world and is one of the top 5 reasons for childhood physician visits in countries that track such data. The incidence of bronchitis in British schoolchildren is reported to be 20.7%. Weigl et al noted an overall increase in hospitalization for lower respiratory tract infection (laryngotracheobronchitis, bronchitis, wheezing bronchitis, bronchiolitis, bronchopneumonia, pneumonia) among German children from 1996 to 2000; this is consistent with observations among children from the United States, United Kingdom, and Sweden. The incidence rate of bronchitis in children in this German cohort was 28%. Differences in population prevalences have been identified in patients with chronic bronchitis. For example, because of the association of chronic bronchitis with asthma and the concentration of asthma risk factors among inner-city populations, this population group is at higher risk. The incidence of acute bronchitis is equal in males and females. The incidence of chronic bronchitis is difficult to state precisely because of the lack of definitive diagnostic criteria and the considerable overlap with asthma. However, in recent years, the prevalence of chronic bronchitis has been reported to be consistently higher in females than in males. Acute (typically wheezy) bronchitis occurs most commonly in children younger than 2 years, with another peak seen in children aged 9-15 years. Chronic bronchitis affects people of all ages but is more prevalent in persons older than 45 years. Acute bronchitis is almost always a self-limited process in the otherwise healthy child. However, it frequently results in absenteeism from school and, in older patients, work. Chronic bronchitis is manageable with proper treatment and avoidance of known triggers (eg, tobacco smoke). Proper management of any underlying disease process, such as asthma, cystic fibrosis, immunodeficiency, heart failure, bronchiectasis, or tuberculosis, is also key. These patients need careful periodic monitoring to minimize further lung damage and progression to chronic irreversible lung disease. Instruct older patients regarding the need for immunization against pertussis, diphtheria, and influenza, which reduces the risk of bronchitis due to the causative organisms. Instruct these patients to avoid passive environmental tobacco smoke; to avoid air pollutants, such as wood smoke, solvents, and cleaners; and to obtain medical attention for prolonged respiratory infections. Instruct parents that children may attend school or daycare without restrictions except during episodes of acute bronchitis with fever. Also instruct parents that children may return to school or daycare when signs of infection have decreased, appetite returns, and alertness, strength, and a feeling of well-being allow. For excellent patient education resources, see eMedicineHealth's Asthma Center. Also, visit eMedicineHealth's patient education articles Asthma and Bronchoscopy. Horner CC, Bacharier LB. Diagnosis and management of asthma in preschool and school-age children: focus on the 2007 NAEPP Guidelines. Curr Opin Pulm Med. 2009 Jan. 15(1):52-6. [Medline]. Brodzinski H, Ruddy RM. Review of new and newly discovered respiratory tract viruses in children. Pediatr Emerg Care. 2009 May. 25(5):352-60; quiz 361-3. [Medline]. Miron D, Srugo I, Kra-Oz Z, Keness Y, Wolf D, Amirav I, et al. Sole pathogen in acute bronchiolitis: is there a role for other organisms apart from respiratory syncytial virus?. Pediatr Infect Dis J. 2010 Jan. 29(1):e7-e10. [Medline]. Voynow JA, Rubin BK. Mucins, mucus, and sputum. Chest. 2009 Feb. 135(2):505-12. [Medline]. Mall MA. Role of cilia, mucus, and airway surface liquid in mucociliary dysfunction: lessons from mouse models. J Aerosol Med Pulm Drug Deliv. 2008 Mar. 21(1):13-24. [Medline]. Kreindler JL, Jackson AD, Kemp PA, Bridges RJ, Danahay H. Inhibition of chloride secretion in human bronchial epithelial cells by cigarette smoke extract. Am J Physiol Lung Cell Mol Physiol. 2005 May. 288(5):L894-902. [Medline]. [Full Text]. McConnell R, Berhane K, Gilliland F, Molitor J, Thomas D, Lurmann F, et al. Prospective study of air pollution and bronchitic symptoms in children with asthma. Am J Respir Crit Care Med. 2003 Oct 1. 168(7):790-7. [Medline]. [Full Text]. Brieu N, Guyon G, Rodière M, Segondy M, Foulongne V. Human bocavirus infection in children with respiratory tract disease. Pediatr Infect Dis J. 2008 Nov. 27(11):969-73. [Medline]. Schildgen O, Müller A, Allander T, Mackay IM, Völz S, Kupfer B, et al. Human bocavirus: passenger or pathogen in acute respiratory tract infections?. Clin Microbiol Rev. 2008 Apr. 21(2):291-304, table of contents. [Medline]. [Full Text]. Allander T. Human bocavirus. J Clin Virol. 2008 Jan. 41(1):29-33. [Medline]. Koehoorn M, Karr CJ, Demers PA, Lencar C, Tamburic L, Brauer M. Descriptive epidemiological features of bronchiolitis in a population-based cohort. Pediatrics. 2008 Dec. 122(6):1196-203. [Medline]. Tsai CH, Huang JH, Hwang BF, Lee YL. Household environmental tobacco smoke and risks of asthma, wheeze and bronchitic symptoms among children in Taiwan. Respir Res. 2010 Jan 29. 11:11. [Medline]. [Full Text]. Ghosh R, Rossner P, Honkova K, Dostal M, Sram RJ, Hertz-Picciotto I. Air pollution and childhood bronchitis: Interaction with xenobiotic, immune regulatory and DNA repair genes. Environ Int. 2016 Feb. 87:94-100. [Medline]. Brooks K, Caruthers RL, Schumacher KR, Stringer KA. Pharmacotherapy challenges of fontan-associated plastic bronchitis: a rare pediatric disease. Pharmacotherapy. 2013 Sep. 33(9):922-34. [Medline]. [Full Text]. Singhi AK, Vinoth B, Kuruvilla S, Sivakumar K. Plastic bronchitis. Ann Pediatr Cardiol. 2015 Sep-Dec. 8 (3):246-8. [Medline]. [Full Text]. Zaccagni HJ, Kirchner L, Brownlee J, Bloom K. A case of plastic bronchitis presenting 9 years after Fontan. Pediatr Cardiol. 2008 Jan. 29(1):157-9. [Medline]. Zahorec M, Kovacikova L, Martanovic P, Skrak P, Kunovsky P. The use of high-frequency jet ventilation for removal of obstructing casts in patients with plastic bronchitis. Pediatr Crit Care Med. 2009 May. 10(3):e34-6. [Medline]. Shah SS, Drinkwater DC, Christian KG. Plastic bronchitis: is thoracic duct ligation a real surgical option?. Ann Thorac Surg. 2006 Jun. 81(6):2281-3. [Medline]. US Department of Health and Human Services. Vital and Health Statistics. National Ambulatory Medical Care Survey: 1991 Summary. Series 13: Data from the National Health Survey No. 116. DHHS Publication; May 1994. Weigl JA, Puppe W, Belke O, Neusüss J, Bagci F, Schmitt HJ. The descriptive epidemiology of severe lower respiratory tract infections in children in Kiel, Germany. Klin Padiatr. 2005 Sep-Oct. 217(5):259-67. [Medline]. Berhane K, Chang CC, McConnell R, et al. Association of Changes in Air Quality With Bronchitic Symptoms in Children in California, 1993-2012. JAMA. 2016 Apr 12. 315 (14):1491-501. [Medline]. Seaman AM. Drop in Air Pollution Tied to Better Breathing Among Kids. Medscape. 2016 Apr 13. [Full Text]. Usta Guc B, Asilsoy S, Durmaz C. The assessment and management of chronic cough in children according to the British Thoracic Society guidelines: descriptive, prospective, clinical trial. Clin Respir J. 2013 Nov 27. [Medline]. Brunton S, Carmichael BP, Colgan R, Feeney AS, Fendrick AM, Quintiliani R, et al. Acute exacerbation of chronic bronchitis: a primary care consensus guideline. Am J Manag Care. 2004 Oct. 10(10):689-96. [Medline]. Ozkan H, Atlihan F, Genel F, Targan S, Gunvar T. IgA and/or IgG subclass deficiency in children with recurrent respiratory infections and its relationship with chronic pulmonary damage. J Investig Allergol Clin Immunol. 2005. 15(1):69-74. [Medline]. Kainulainen L, Nikoskelainen J, Ruuskanen O. Diagnostic findings in 95 Finnish patients with common variable immunodeficiency. J Clin Immunol. 2001 Mar. 21(2):145-9. [Medline]. Nelson MR, Adamski CR, Tluczek A. Clinical practices for intermediate sweat tests following abnormal cystic fibrosis newborn screens. J Cyst Fibros. 2011 Dec. 10(6):460-5. [Medline]. [Full Text]. Donnelly JP, Baddley JW, Wang HE. Antibiotic utilization for acute respiratory tract infections in u.s. Emergency departments. Antimicrob Agents Chemother. 2014 Mar. 58(3):1451-7. [Medline]. Kronman MP, Zhou C, Mangione-Smith R. Bacterial prevalence and antimicrobial prescribing trends for acute respiratory tract infections. Pediatrics. 2014 Oct. 134 (4):e956-65. [Medline]. Frellick M. Antibiotics Prescribed for Kids at Twice Expected Rate. Medscape Medical News. Available at http://www.medscape.com/viewarticle/831684. September 15, 2014; Accessed: June 16, 2015. Ivanovska V, Hek K, Mantel-Teeuwisse AK, Leufkens HGM, van Dijk L. Age-Specific Antibiotic Prescribing and Adherence to Guidelines in Pediatric Patients in Primary Care. Pediatr Infect Dis J. 2018 Mar. 37 (3):218-223. [Medline]. Barnett ML, Linder JA. Antibiotic prescribing for adults with acute bronchitis in the United States, 1996-2010. JAMA. 2014 May 21. 311 (19):2020-2. [Medline]. Frellick M. Antibiotic Scripts for Bronchitis Common Despite Guidelines. Medscape Medical News. Available at http://www.medscape.com/viewarticle/825471. May 21, 2014; Accessed: June 16, 2015. Kamin W, Maydannik VG, Malek FA, Kieser M. Efficacy and tolerability of EPs 7630 in patients (aged 6-18 years old) with acute bronchitis. Acta Paediatr. 2010 Apr. 99(4):537-43. [Medline]. [Full Text]. Kamin W, Maydannik V, Malek FA, Kieser M. Efficacy and tolerability of EPs 7630 in children and adolescents with acute bronchitis - a randomized, double-blind, placebo-controlled multicenter trial with a herbal drug preparation from Pelargonium sidoides roots. Int J Clin Pharmacol Ther. 2010 Mar. 48(3):184-91. [Medline]. Marchant J, Masters IB, Champion A, Petsky H, Chang AB. Randomised controlled trial of amoxycillin clavulanate in children with chronic wet cough. Thorax. 2012 Aug. 67(8):689-93. [Medline]. Cronin J, Kennedy U, McCoy S, An Fhailí SN, Crispino-O'Connell G, Hayden J, et al. Single dose oral dexamethasone versus multi-dose prednisolone in the treatment of acute exacerbations of asthma in children who attend the emergency department: study protocol for a randomized controlled trial. Trials. 2012 Aug 21. 13:141. [Medline]. [Full Text]. Beckhaus AA, Riutort MC, Castro-Rodriguez JA. Inhaled versus systemic corticosteroids for acute asthma in children. A systematic review. Pediatr Pulmonol. 2013 Aug 8. [Medline]. Chang AB, Oppenheimer JJ, Weinberger MM, Rubin BK, Grant CC, Weir K, et al. Management of Children With Chronic Wet Cough and Protracted Bacterial Bronchitis: CHEST Guideline and Expert Panel Report. Chest. 2017 Apr. 151 (4):884-890. [Medline]. Ray WA, Murray KT, Hall K, Arbogast PG, Stein CM. Azithromycin and the risk of cardiovascular death. N Engl J Med. 2012 May 17. 366(20):1881-90. [Medline]. [Full Text]. Giudicessi JR, Ackerman MJ. Azithromycin and risk of sudden cardiac death: guilty as charged or falsely accused?. Cleve Clin J Med. 2013 Sep. 80(9):539-44. [Medline]. [Full Text].